Lisa Neeley (cee West) was born in Wahpeton, ND in the year 2349. Her father was a teacher and her mother was a stay at home mom. Ever since the age of four Lisa dreamed of leaving the small town of North Dakota where she was born and raised. During her sixth grade year she met the man she would eventually marry. They both enrolled in Starfleet Academy together in the fall of 2367 and they were married during Christmas break their freshman year. All was well until their senior year when a group of rogue Federation citizens formed a group called the Maquis. After graduation Lisa was assigned to Starbase 234 while her husband was assigned to the USS Adelphi which was patrolling the DMZ. He didn't even have the stones to tell Lisa he left Starfleet for the Maquis. Despite having not contacted her husband since graduation and being in the Beta Quadrant near the Romulan Neutral Zone she went thru a period where she was not trusted. He was believed killed when the Jem Hadar nearly wiped out the Maquis after the Cardassians joined the Maquis. His betrayal and the lack of trust from her fellow officers did not impact her ability to get promoted as she was promoted to Lieutenant junior grade mid 2374. 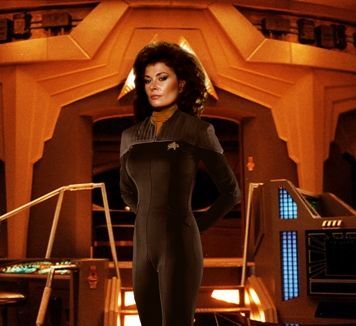 In 2376, she was transferred to Starbase 16 which was near the Klingon Border where she served for three years before getting reassigned to the newly built Deep Space Nine which was a replacement for the original that was destroyed. The assignment came with mixed feelings since she would be serving under Commander Ro who used to be in the Maquis. She certainly wanted to ask Ro about her husband. After the death of Lieutenant Bemi she was selected by Commander Odo to be the new Assistant Security Chief on Deep Space Nine.